Michigan had, during the 19th and 20th centuries, over 30 French-language newspapers published for its French Canadian population. In what I believe is the only study of its kind, George J. Joyaux’s 1952 article “French Press in Michigan: A Bibliography” (Michigan History, September 1952) describes each publication, many of which were published for a very short period of time. John P. Dulong, in French Canadians in Michigan and Jean Lemarre in The French Canadians of Michigan discuss these publications, in brief, as well. Some of the newspapers are available in libraries in the original or on microfilm and a few have now been digitized and are available through Google’s newspaper archive. The following (and in the gallery above) is a selection of extracts from those now available online. These newspapers reveal a great deal about Michigan’s French Canadian culture of the 19th century. They are an important resource for researchers, including historians, genealogists, ethnographers, and folklorists. Français du Territoire de Michigan ! vous devriez commencer immediatement a donner une education à vos enfants — French people of the Michigan Territory ! you should immediately begin to give your children an education. John R. Williams, the first mayor of Detroit, is also featured in the Gazette, in an advertisement for his trading business – a venture with his uncle, Joseph Campau. 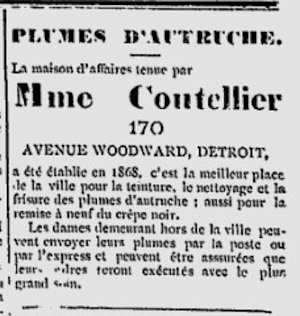 Advertisements for retail found in Detroit include Madame Coutellier’s shop where ostrich feathers could be dyed, cleaned, and crimped! There was news of the Franco-American community of Fall River, Massachusetts in the December 18, 1885 issue, and in January 1886 an ‘advertorial’ inviting people from other French-speaking areas, including Quebec and France, to come to the Essex County, Ontario where 40,000 Francophones were living. A. Bodard draws attention to the local agricultural community, the produce, and the wonderful climate. Metis and First Nations affairs are also covered, including articles on the Red River Rebellion. A dispatch from Winnipeg reports on the death of Louis Riel’s mother, and a few months later in a December 1885 issue, his own funeral is also reported; a separate article reports on the activities of Gabriel Dumont. A ‘linguistic curiosity’ is published in the same issue as Riel’s funeral report – a translation of the Divine Mass into the language of the Pieds Noires, the Blackfeet indians. On July 20, 1888 a list of regional delegates to the national convention of the Société St. Jean Baptiste was published. In the same issue there is an open letter concerning the great fire of Alpena which destroyed many homes and killed many people. The Alpena area was home to many people of French Canadian heritage, recent immigrants from Quebec. The letter was from the regional representative of the Société St. Jean Baptiste, Monsieur de Laval, seeking the aid of the Société in Quebec. Excerpt from an article on an old voyageur, l’Ouest Français, August 31, 1888. 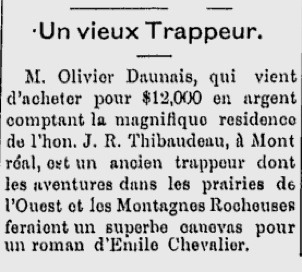 A final example from l’Ouest Français is a short column entitled “Un Vieux Trappeur” about the affairs of a former voyageur, Olivier Daunais. Daunais, according to the article, was known for his exploits in the West and the Rocky Mountains and suggests he would be a great subject for the author Henri-Emile Chevalier. An excerpt from an advertising panel in the Lake Linden-based l’Union Franco-Americaine includes numerous artisans from the area including Lake Linden and Red Jacket, and an ad for the College St. Viatur de Bourbounnais of Kankakee, Illinois – clear evidence that the French communities of the “Haut Michigan” were not isolated towns, but part of a regional and international French Canadian culture. Advertising in l’Union Franco-Americaine, Lake Linden, Michigan June, 4, 1891. This is further revealed in an advertisement in the June 4, 1891 edition of l’Union for a Grand Excursion from ‘Haut Michigan’ to Ste. Anne de Beaupre. Travel between the Great Lakes and Quebec was not then, nor was it ever, a one-way affair. Such advertisements for trips to Ste. Anne were not uncommon. This pilgrimage destination advertised in Michigan’s French press of the 1800s, continued to be followed into the late 20th century and in fact continues today among people of French Canadian heritage. These highlights from Michigan’s French newspapers show a growing community that is interested in maintaining it’s language and culture. It is a community that travels, with links throughout the region, and to other regions of the French Canadian world. It reveals that along with an influx of recent immigrants from Quebec, there is also the continued presence and cultural influence of an ‘old guard’ French Canadian community – the original habitants and voyageurs continue to be part the local cultural narrative.